Please check the Guider Training Calendar regularly so you can stay up to date with your training! This is a Tip Sheet for Guiders about opportunities for doing boating such as canoeing, kayaking, sailing and standup paddle boarding in Calgary Area. Girls of all ages are allowed to do some boating. There are options for indoors and outdoors so boating can happen year-round! CCC will come to your unit meeting or camp and provide free programming focused on nature and conservation. Programs available for all ages. Details here. Inch by Inch Empowerment has created workshops tailored to Guiding age levels to help girls believe in themselves, overcome bullying and find their inner confidence. More details are available on this information page. ConnecTeen is the Calgary Distress Centre's peer support service. They will come to units and provide FREE 45-minute presentations. Highly trained youth volunteers will help facilitate discussions with your girls about stigma and mental health as well as discuss common mental health concerns or issues they may be facing. The presentations are best suited for Pathfinders and Rangers. They will consider presenting to Guides if the girls are mature. To book a presentation, visit the Parents and Professionals page on the ConnecTeen website. Engineering for Kids puts the fun in STEM through hands-on engineering activities for kids ages 4-14. From designing and constructing rockets, hovering cars and rollercoasters to robotics, video game designing and much more. We are pleased to offer special reduced pricing for Girl Guide units. Refer to our handout for further details about our workshops. Rivers Edge Camp is now offerring horsemanship programs specifically designed to match GGC badge requirements. Three different programs are offerred for Brownies, Guides and Pathfinders/Rangers. Girls will learn to safely care for and ride well trained horses. Lessons include horse safety and care, grooming, stable management, caring for tack and saddling (older girls) and riding skills. The camp also offers a wide range of other activities and accomodations so units can spend the whole day or weekend at the camp if desired. See Rivers Edge website for full details. This empowering series of workshops equips participants with knowledge and skills to develop their sense of identity, self-image and self-management. Girls will participate in interactive demonstrations and activities enabling them to uncover their own unique talents and skills, while also getting to know their personal style and taste for fashion. Professional tips and techniques will also be shared for smart shopping, maintaining your clothes and your natural beauty, and creating the overall desired appearance. Workshops are best suited for Pathfinders and Rangers but can be adapted for Guides as well. The Memory Project is an organization that connects active serving Canadian Forces members and veterans with speaking engagements in their community. You can read more about us on our website. All of our programming is free of charge. To book a speaker please fill out our online form here or contact me directly via phone or email. While Remembrance Day is our busiest time, we operate all year round. Please consider booking for one of these upcoming dates. We also offer a variety of free learning materials, including a FREE DVD. If you would like a DVD please email LHartwell@HistoricaCanada.ca or phone 416-506-1867 x 235. 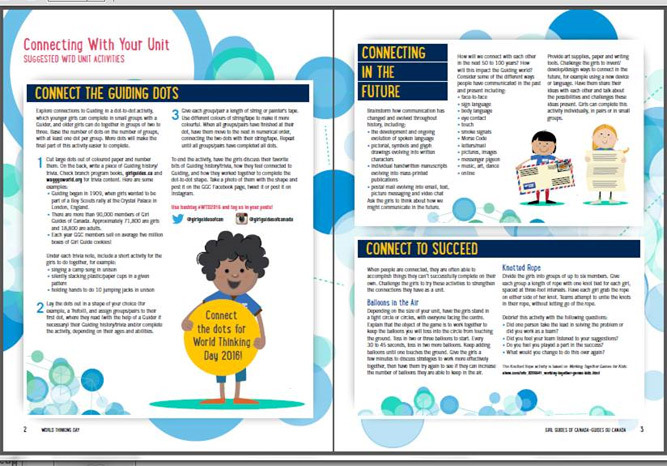 Click the image above to download a fun new World Thinking Day resource from National! The Windows store at Chinook Mall offers youth field trip programs that tie in with the GGC STEM program. Host a local author at unit meetings! IMPORTANT: There are geocaches that have already been placed on GGC campsites that only GGC Members have access to. Caches that are set on GGC campsites CANNOT be published on geocaching.com to be found by the general public as they have been placed on PRIVATE property. You as a Guiding Member can go find them, but the general public cannot. The coordinates for these caches are already programmed into the south set of provincial GPS units. If you would like the coordinates for these geocaches, please contact Karla through the Calgary Program Committee, any-calgaryprogram@girlguides.ca with a subject line "attn: geocaching coordinator"
If you would like to place a geocache on a GGC campsite please contact Karla through the Calgary Program Committee, any-calgaryprogram@girlguides.ca with a subject line "attn: geocaching coordinator"and we can go over the Calgary Area policy.